At Bear Lake Memorial, you can count on us to care for your lung health. 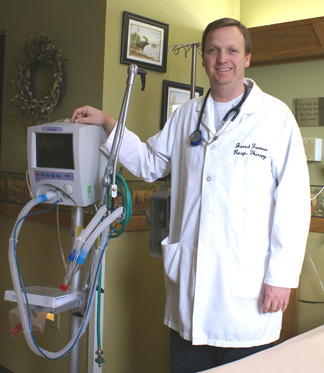 We provide a wide variety of respiratory care services. Our outpatient services include pulmonary function testing and nebulizer treatments. We have a sleep lab to help diagnose and suggest treatment for a variety of sleep disorders. If you are looking for help to quit smoking, our therapist is certified with the American Lung Association to assist in smoking cessation. Our emergency department also provides respiratory care for asthma, pneumonia, croup and allergic reactions. For more serious cases we can provide ventilator support and resuscitation if needed. As an inpatient, you can receive pulmonary function testing to aid in the diagnosis of lung problems. We also provide nebulizer treatments, chest physiotherapy and other treatments to help in the recovery of respiratory problems.